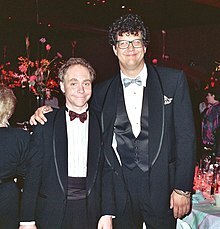 Teller and Penn at the 1988 Emmy Awards. Penn & Teller are a two-man magic and comedy team, Penn Fraser Jillette (born 5 March 1955) and Teller (born Raymond Joseph Teller, 14 February 1948). All the quotes from the duo come from Penn, except where noted, as Teller is famously silent. The idea of mind-altering substances gives me the willies. Fill your tank with nitro, the car goes fast, sure, but not far. This I believe: I believe there is no god. Teller: Will you shut up! Homer Simpson: Hey, I thought you didn't talk. Teller: [nervously] Uh, I didn't mean to... it just slipped out. Oh god, now Penn's gonna beat me...I'm not the first Teller. The Simpsons, "Hello Gutter, Hello Fadder"
This page was last edited on 16 October 2018, at 17:00.